The Bro app has a very open approach to online hookups. This is a no nonsense app which claims to be the one of a kind guysexual platform for all the straight, gay and bisexial men out there. There are no qualms about this sort of platform. When you enter you come here not just for dating, but also for the sake of having friendships with the male counterparts irrespective of their preference. The app was launched in 2016.The app is like a bright smile if you do not want to be on platforms like the Grindr as there will be more people here doing happy social things then the desperate attempt to win a date. Here straight people can also look for friendships with the so called bromance factor. This app is a place to hangout, nothing serious, you don't have to commit. You only need to be on this app and know more people without getting attached to anyone. The app is not complicated but it is still smart. It also asks for your HIV status when you log in, just incase. It might not be a good app for first timers but it surely is to hit and find the Bros in town. Just like the other apps you need to be registered to start using this app. This can be done in very simple steps. Just enter your email address and keep a password later verify your account. You can also use facebook login access to register yourself on the Bro the network. The only condition is that the users need to verify themselves with a profile picture and the platform comes with an 18+ limitation anyhow. You have to also enter the details of your body type, HIV status, body type and your “bro’ type to set up your account on Bro The App. The application has made it to the likes of huffingpost as it offers a very open minded and non judgemental approach to the concept of going online finding dating. It does not give any heavy labels of sexual orientation type or relationship status. It is a simple Bro platform looking for other bros for some bromance, long term or not, dating or not. Of Course this is made for gay men but for others too. 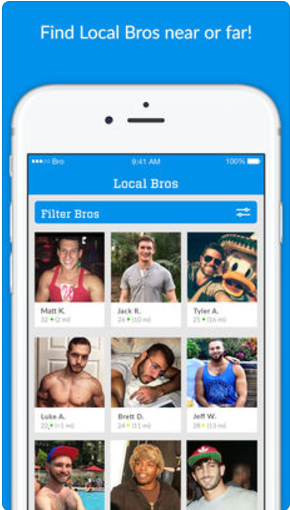 You can browse and search profiles as there is also a Local Bros and Bros of the day section on the app. There are also options for checking out and personal message.